Precise audio and comfort are where it counts when it comes to reference headphones and the AKG K7XX reference headphones excel in both of these areas. They're easy to recommend for producers, but those who simply want to listen to music with neutral sound would also do well to check them out. AKG has a rich history in terms of monitoring headphones, and its K7 series has been responsible for several industry legends. Among them are the 65th-anniversary AKG K702 reference headphones, upon which the Limited Edition K7XX—being reviewed here today—are based. These come in an all black version, or all-black with red highlights, and both include a few tweaks to the K702 formula to make them more than just the same phones in a new dress. The K7XX has been around for several years now, and have appeared exclusively on Massdrop a number of times. So, they’re clearly in demand, but are they any good? Let’s find out. Open backs mean no isolation to speak of. What’s in the AKG K7XX box? AKG’s Limited Edition headphones arrive in a huge box without much in the way of extras. Inside, you’ll find the headphones, a detachable XLR to minijack cable and a 1/8-inch to 1/4-inch jack adapter—and that’s it. The headphones themselves are similarly uncomplicated, with no buttons, dials, or controls of any kind. The message from AKG is clear: put these on, sit back, and listen. The K7XXs are open-back reference headphones, meaning they’re predominantly aimed at those producing music or critical listening rather than the mass market. The open-back nature allows for an experience close to what studio monitor speakers offer, providing the sensation of a wide stereo picture that you’re always in the center of—but with virtually zero isolation. Sure, you can still use these to listen to music purely for enjoyment (and, spoiler alert, I will later recommend that wholeheartedly) but they’re designed for a natural, uncolored sound rather than being specifically tweaked to boost, heighten and otherwise manipulate the audio for more vibrancy. 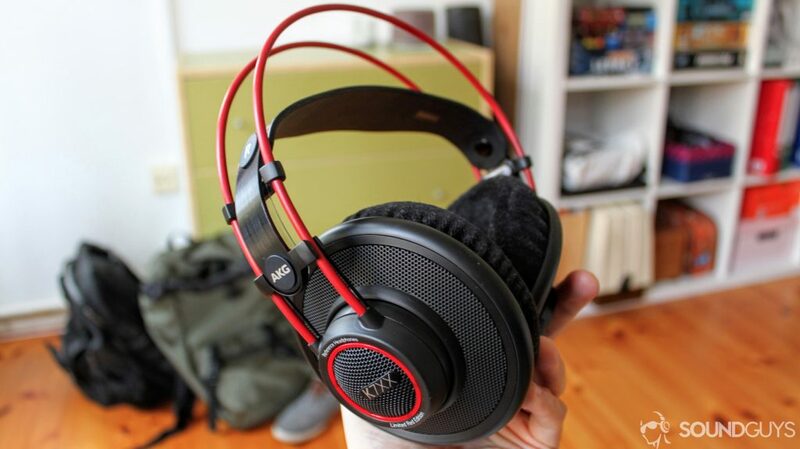 Seen here in the red variant, the AKG K7XX also comes in pure black. The K7XXs offer little in the way of visual charm. Once you get past the fact they have red highlights—where many other reference monitors are simply black, gray or silver—you’ll realize that this is just about where the aesthetic appeal ends. They’re built from quite plain pieces of large plastic, with a couple of brushed plastic sections and a leather head strap. Boy are these comfortable headphones. I’ve been wearing them for most of my work days for weeks now, and I’ve yet to come across a moment where I’ve even considered that my ears need a break. 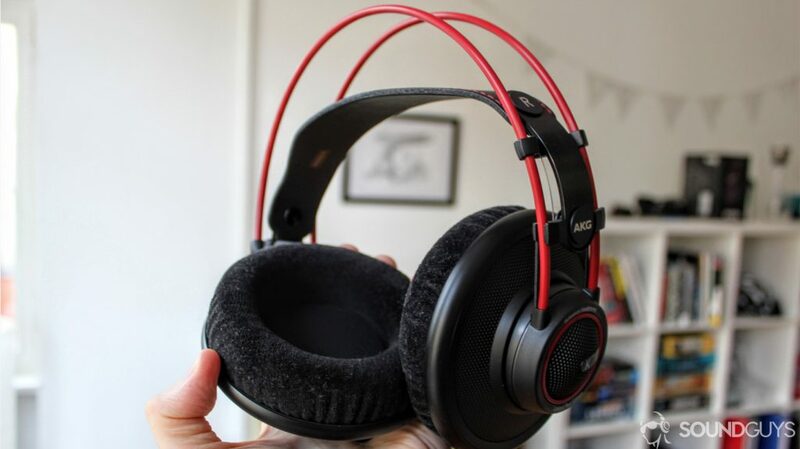 This is partly thanks to the lightweight build and elastic headband system; the leather strap slides up and down the red frame assisted by four pieces of elastic, allowing the headphones automatically adjust to the size and shape of the person’s head they’re placed on. It’s not a gimmick or something just for show—you might not even notice it—it’s an effective solution that adds great support. Real velour earpads are quite comfortable. The other part of this comfortable design comes from the cups themselves. These huge discs feature a fierce combination of velour padding and memory foam—and your sensitive ears will likely fit completely inside of them. All you’ll feel is the soft padding on the sides of your head. So, they’re well-cushioned, and lightweight, which is a good thing… but with a plastic build also comes a somewhat cheap feel. For example: The driver enclosures themselves are a bit loose and wobbly when held. This is an inherent part of the design, they’re attached to a maneuverable joint so that they fold comfortably onto the head. Once they’re there, I have no complaints whatsoever about this specific part of the design; it just means they don’t exactly scream “premium.” This lack of quality is also echoed in the two pieces of plastic that surround the unit (the red bands that run from the cups over the top), which are similarly flimsy. One of the best parts of the AKG K7XX’s design is the band. All that being said, I would take a pleasant feel on the head over the hand every time, so these really are small quibbles considering the K7XX is among the comfiest headsets I’ve ever worn. How durable are the AKG K7XX? Durability is hard to ascertain over a month or so with a product, but aside from the wobbly bits described above: I don’t have any concerns going forward with the K7XX. They can bend and flex in several areas, meaning they should hold up well in falls; they come with a pleasingly thick cable, and a genuine leather head support beneath the plastic arch at the top; and I’d wager that the chunky plastic cups could take a beating. If one of the four bands of elastic on the K7XX breaks, however, it could be another matter. Anything elastic has a shelf life, and I don’t know how long that could possibly be, but if those die: you’ll likely lose part of that comfy feel—if not all of it. Still, treat these right and that situation may never arise. Light plastic might be easier on the head, but it comes at the price of reduced durability. The K7XX are both tall and wide, delivering a great space inside the mix. While the balance isn’t perfect across the whole spectrum, it excels in many areas. Beginning with the high end, cymbals don’t quite have the intensity that you might find on more commercial sounding cans—which isn’t surprising as most consumer cans have a huge overemphasis at about 7-10kHz. But despite losing some prominence at the higher end of the frequency spectrum, you’re still getting that accurate image that you’d hope for from reference headphones. And the lower power at this region mean you completely avoid the sibilance that can plague vocals—and if your headphones produce that “Sss” sound, good luck ever getting used to it. These open-back cans are audio legends. Because there’s no real range of notes that overpower others, you may notice a lot of qualities to the drum kit that you haven’t noticed before, and it’s partly down to the capabilities of the AKG K7XX drivers. This is something that can be appreciated when listening to Metal in particular. Tracks that can get entirely squished in some headphones, are crystal clear on the K7XX. Careful with those band loops: they’re flimsy. The K7XX midrange is expertly crafted: electric guitars, lead synths, and your brass instruments are well-balanced—again, the advantages of a flat frequency response. String sections are also reproduced excellently in these and, likewise, it owes a lot to the space created around them. So there’s a lovely smoothness here, but you might notice that K7XXs’ take some of the volume out of vocals. This is a better problem than vocals sounding more powerful than they really are: especially if you’re producing. There’s nothing wrong with trying to get more from a singer in the studio, after all. If you’re just using these for listening, though, male vocals in particular might sound unimpressive to some listeners because most people are used to overemphasized bass in their headphones. Part of the reason why the AKG K7XX is so affordable? Check the logo. AKG has absolutely nailed this section of the spectrum. And these headphones blast out that “punchy” sound without it being surrounded by the unwanted resonances that cruder, cheaper headphones accidentally produce. If this is specifically an area where you’d focus on when programming or recording, be it when trying to get fat snare sound, to add weight to your kick drum, or to get that “pop” from the bass guitar (like you often hear in funk), you’ll really be able to pin it down here. And the accuracy here would help over-driven electric guitars and brass instruments sound hot, too. A removable/replaceable cable is the single most important durability feature to have. Bass is usually a tough thing to get right on reference headphones due to the smaller driver sizes, and the Massdrop-exclusive K7XX feature a ~3dB boost down there that wasn’t in the original headphones… And it seems to have been a smart move, given the audience. Like in the higher frequencies, these bass tones aren’t overdone, but goodness these cans can get all over that bottom end. In cheaper headphones, you can hear the limits of the drivers, where it seems like the headphones just can’t quite do your music justice. And at other times, headphones just increase the whole bass section and hope for the best. The AKG K7XX is at home on your desk. But the K7XXs get right down to the bottom of the bass and then some. You always feel like you’re in safe hands, like watching a gifted limbo dancer, knowing they could get that bit lower, if they really had to. I find it absolutely invaluable to have that kind of confidence in my cans in the studio and these headphones really deliver on that front. But, like many open-backed studio monitors I’ve tried over the years, (and recently like the Sennheiser HD 598s) you’re going to have to lean back a tad on the bass in general when you’re producing. Basically, if the bottom end is loud enough, don’t get that temptation to try and pump any more into it to really get the heartbeat thumping. It’s going to be an over-adjustment and you’ll notice it as soon as you switch to a Hi-Fi or your regular listening headphones (just do it as a test to hear what I’m talking about if you get them). Just trust the cans — the bass will be ample. Are the K7XX worth the money? The original AKG K702 had an insane cost of around $600 when they first arrived—far too pricey considering the build quality—but these have recently been selling for around $200 via Massdrop. And this is fantastic value for these headphones. If you’ve listened to good headphones they might not blow your shorts off, but if you’re only used to sub-$100 headphones and you jump to these, you’re going to be impressed. And, like all the best headphones, they’re going to help you hear parts of the mix that you’d never even picked up on before. Though I expect most people will want these for mixing in the studio, I still want to recommend these purely for listening at home. You’ll find headphones with a flat frequency response like that of the AKG K7XX offer a very detailed sound, but not everybody wants this from their cans—sometimes you want to listen on a commute, and these are definitely not the cans for that. If you want to get to the heart of your favorite tracks, the K7XX are headphones that you’d be crazy not to consider. They’re made of expertly tuned components by time-tested industry legends AKG, and you can hear each instrument clearly. For producers, it’s an easy sell: you’ll be on the receiving end of clinically accurate audio that will let you mix with precision. In case I haven’t made it clear enough already—there’s far more than 200 bucks worth of headphone in the AKG K7XXs. If you can get them at that price, you should.